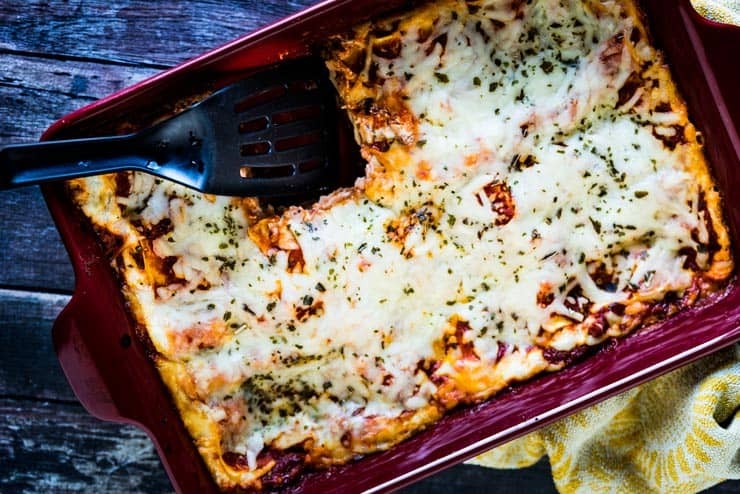 This Easy Cheesy Meatless Lasagna uses no-boil noodles (my favorite!) to make this as simple a recipe as possible! Life is all about moderation, right? 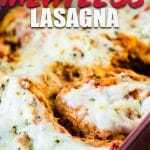 And sometimes, you just need a quick and dirty lasagna recipe in your arsenal for when you don’t want to reach for the Stouffers but are craving lasagna. This Cheesy Meatless Lasagna uses one of my favorite lasagna short-cuts– no-boil noodles! I’ll link to my favorite brand in the recipe, and I love that they are cut into super thin sheets and are reminiscent of homemade pasta. Confession: Even when I do make my alllllll-day lasagna I still use these no-boil noodles. I love them! Can I add meat to this cheesy meatless lasagna? Yes, of course! Just layer it in between the cheese and sauce, and you’ll be good to go. What else can I add to this cheesy meatless lasagna? Thinly sliced zucchini or yellow squash– just make sure to sprinkle a little salt over each layer. Ground beef, turkey, Italian sausage, or chicken. If you like your ricotta cheese layer to be a little firmer, add an egg to the cheese mixture when mixing. 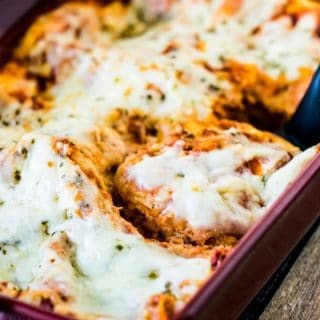 You can freeze this recipe before baking, so you always have a lasagna ready to go in your freezer if you need it! Just take out of the freezer and allow to thaw for 24 hours in the fridge before baking. Use your favorite pasta sauces! You can even substitute a jar of alfredo sauce for one of the jars of tomato sauce if you’d like. Just skip the step of mixing the two sauces and alternately layer them in the pan. Adding alfredo sauce makes for a super creamy, extra-cheesy lasagna. Want More Easy Pasta Recipes? Anolon Vesta Rectangular Baking Dish: This line of stoneware from Anolon is one of my favorite things in my kitchen. They come in gorgeous colors, bake evenly, aren’t ridiculously heavy like enameled cast iron and last. Love mine– especially for lasagna! Spring Chef Box Grater: Grating cheese is usually a task I pass off to my kids because I hate it, but this grater makes it as enjoyable as it can be. 🙂 I love the four sides and that they include a slicing blade. Get It Right Silicone Spatulas: I have waaaaay too many of these spatulas floating around in my kitchen but I just love them! They are heat-resistance and can be used for both baking and cooking so they are basically my go-to kitchen tool. I love that they come in lots of vibrant colors and are easy to clean. Most of the spatulas I have are at least 4 years old and still look new! Combine both pasta sauces in a medium-sized bowl. In a separate bowl, combine ricotta cheese with the parmesan and 8 ounces of the mozzarella cheese. Use a spatula to divide the cheese mixture into four parts in the bowl by marking the top. Spread 1/2-3/4 cup of the pasta sauce over the bottom of a 9x13" pan. 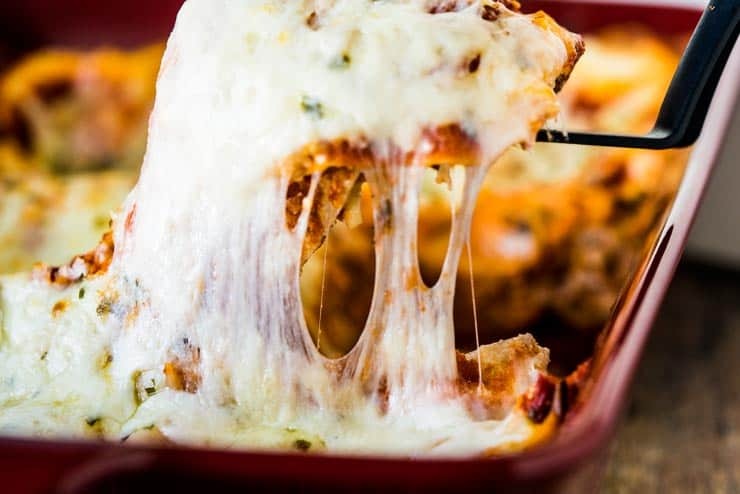 Lay three lasagna noodles on top of the sauce and spread 1/4 of the cheese mixture over the noodles followed by another cup of sauce. Continue this same process with three more layers and top with the remaining noodles. Spread sauce over the top noodles followed by the remaining mozzarella cheese and dried parsley. Cover pan with foil and bake for 45 minutes. 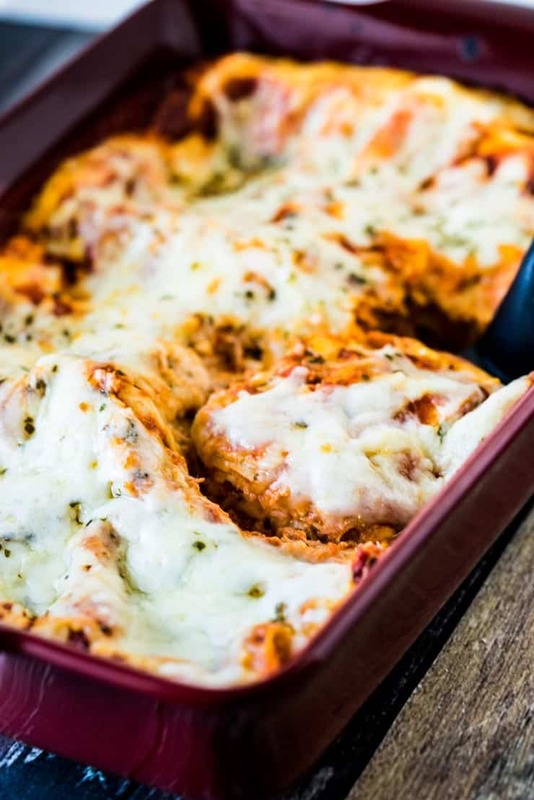 Remove foil and continue to bake and additional 5-10 minutes or until the cheese starts to brown and the lasagna is bubbly. Allow to cool for at least 10 minutes before cutting and serving.